Dissecting the Ultimate Weight Loss Supplement Scam! Home » Spam & Scams » Dissecting the Ultimate Weight Loss Supplement Scam! Relaxed regulations, a desperate audience, truckloads of money and overburdened government regulatory agencies means there are a TON of scams in the weight loss supplement space. We’re going to take a close look at one today. Promises of easy money bring oodles of scammers; government agencies overwhelmed. Online ads and email spam draw you in; one weird trick to lose weight now! Introducing the “farticle”; bogus celebrity endorsements are used to make you buy, now! Fighting back! Share this article and tweet it to the FTC Commissioners and Racheal Ray! There’s Weight Loss Gold In Them There Hills! With the weight loss industry being one of the largest, most profitable, “evergreen” markets (meaning there will always be a demand for these products) in North America, it’s a perfect breeding ground for scammers, charlattans and scumbags. Many of these people, unfortunately enough, are pretty darn good at marketing useless crap to desperate consumers. Most agencies are so far behind the scammers, all they can do is punish the biggest, most “visible” ones long after the damage is done. Thanks to private labeling services, *anyone* with a few hundred dollars can sell their own brand of supplement. The laws applying to nutritional supplements are very wishy-washy and there’s lots of grey areas to hide behind. 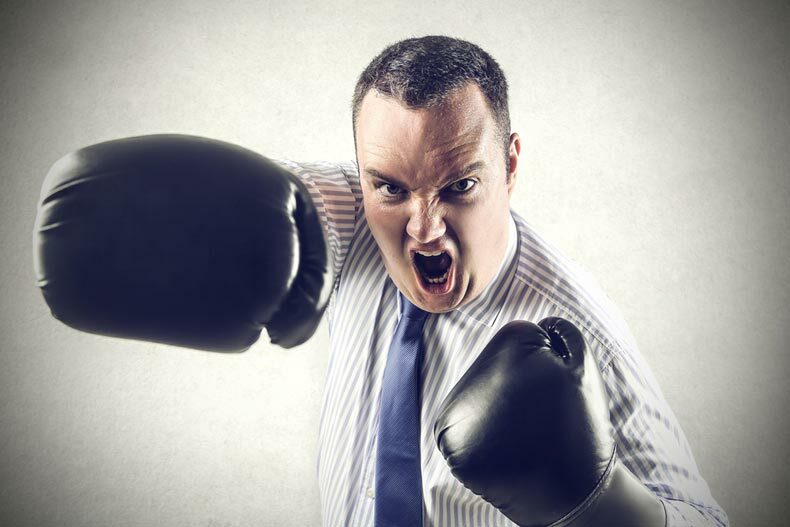 Consumer protection agencies, in general, are under-staffed and under-funded; there are simply not enough people to stay on top of the scammers. … it quickly becomes obvious that the only way you’re going to avoid being scammed, is to become educated in the tactics of the scammers. That’s what we’re hoping to do here! One amazing/weird/stronge trick to lose weight now! See the one weird tip people everywhere are using to lose weight fast! GNC manager stunned by demand for weight loss breakthrough! Controversial weight loss breakthrough stuns doctors! Alternatively, ads for these products show up in your email program. Sending unsolicited bulk email is illegal, so any company (or their affiliates) who market in this manner have by definition, a serious credibility problem. 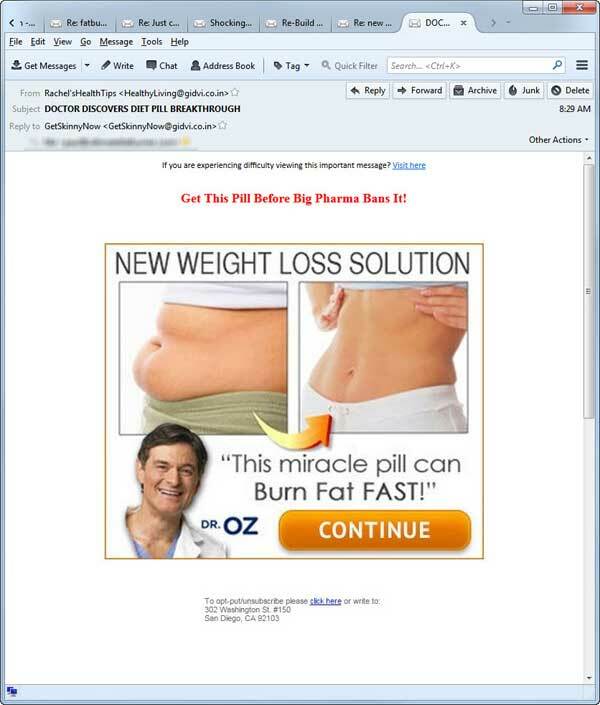 As you can see, it features a picture of Dr. Oz – which suggests an endorsement and is used to add credibility to the offer – and standard “weight loss miracle” bullsh*t in an attempt to draw the visitor into clicking the ad. If you receive a spam email like this one, report it directly the FTC. And if you do, what’s next? In the world of online advertising, authenticate looking but entirely bogus articles are known as “farticles.” That’s a combination of the words “fake” and “articles”. They work very well for adding credibility to the offer, which is why most scammers use them as a “landing page” (i.e., the page you are directed to after clicking an online ad or email link) instead of sending you directly to the product page itself. The U.S. Federal Trade Commission has been working to shut down these sites (it recently shut down two more), calling them “scammy marketers that use “fake news sites, fictional reporters, and bogus celebrity endorsements” to sell products. But they missed a couple. For example, if I click the link on the spam email above, I end up on an “official” looking article which appears to have been pulled from a magazine, ‘Consumer Health and Reviews’.” This so-called article has only one purpose: to sell an overpriced weight loss supplement called Pro Lean Forskolin (we’ll talk about what that product is in a moment). But if you actually start clicking on links, you’ll see the fascade begin to crumble – none of the links in the header (including the Help, RSS, Wh Store and Look Better Naked) link to other articles. All link to the sales page for Pro Lean ForSkolin. … suggest the article is written by her. Of course, as already noted, using “bogus celebrity endorsements” is a common tactic, and as if to emphasize this, a video snippet from the “Dr. Oz” show starts playing immediately after the page loads up. For whatever reason, a disclaimer is used here; although Dr. Oz has not endorsed this product, he has endorsed the ingredients used in it (not that an endorsement from Dr. Oz is worth much anyway, but whatever…). And of course, no scam weight loss product advertorial would be complete without a number of logos of prominent news media agencies, none of which have endorsed or featured this product, I’ll be willing to bet. Rachael’s investigation is, as you might not expect, not particulary investigative, but instead, a pretty rousing testimonial for Pro Lean Forskolin. She selflessly volunteers to try the product herself, even though the results obtained in any personal trial – if it actually existed – would not constitute evidence of anything (personal testmonials are always considered anecdotal evidence). What they didn’t do – and you’ll see why in a moment – is link to the full text of the study. Because if they did you’d be able to see that the greatest amount of weight lost by study participants during the course of the entire 12-week study was 2.39 kg, or just a skosh over 5.25 lbs. That’s less than half a pound per week. They also didn’t link to studies like this one, which reached a contradictory conclusion; that forskohlin does not help with weight loss. I wonder why? Oh yeah… right. It doesn’t help sales. As our full review clearly shows, the clinical data supporting its use as a weight loss aid is inconsistent. Studies are small and preliminary. At best, it may help a tiny bit, but it’s a loooong way from a miracle. Not surprisingly, Rachel’s results were amazing. Miraculous, you might say, given what the clinical data on forskohlin really says. Hell, Rachel lost more weight in a week than participants in the study they reference on the sales page did in 3 months. Yeah. That’s the quote attributed to her on the page. As a celebrity, Rachael’s fairly recent weight loss has been noted and discussed publicly. But as you can see from this article and this one, there’s nothing revolutionary about how she did it; she became passionate about exercise, and an advocate of the Mediterranean Diet. Or, in other words… hard work and diet. In neither article does Rachael mention any supplement use. I’ve already discussed how little testimonials mean. After all they’re impossible to authenticate, are easily fabricated, and cheap to buy. The “add a comment” link does not function. The “View 876 More” (comments) link does not function. The “Facebook Social Plugin” does not function. … so it’s very likely they are not. Additionally, several testimonials I read mention seeing a “report on T.V.”, which I suspect is complete and utter bullsh*t, pardon my French. A T.V. commercial would expose the retailers to much greater scruntiny from the FTC (who are already pursuing such scams), and possibly draw the attention of Dr. Oz and Rachael Ray, neither of whom would be particularly pleased by the unauthorized use of their names and would no doubt be on the phone to their attorneys in minutes. This scam works because for the most part it operates under the radar, out of mainstream view. After all, you have to click an ad or open a spam email to ever see this page. Now that you know how this weight loss scam operates (and actually this same format is used to sell all sorts of natural supplements – from men’s testosterone replacement to joint therapies to anti-aging stuff), why not do something about it? Don’t ever buy anything advertised from a page like this. Second, make use the social icons below to share this article with friends, family, colleagues and loved ones. The more people who know how this works, the better. … to send a tweet to the commissioners Josh Wright, Edith Ramirez and Maureen Ohlhausen of the U.S. FTC to let them know that although we appreciate all their good work, this scam is still operating full bore. … to send the same tweet to commissioners Julie Brill and Terrell McSweeny. If we get the word out, we can make this stuff stop. But we gotta get it out. With your help, we can do that!